“Make lemonade with recession lemons” seemed to be John Martinson’s message on Thursday, January 8, when he spoke to ACG-NJ, a networking group for merger & acquisition pros, at an evening meeting at the Westin Princeton. 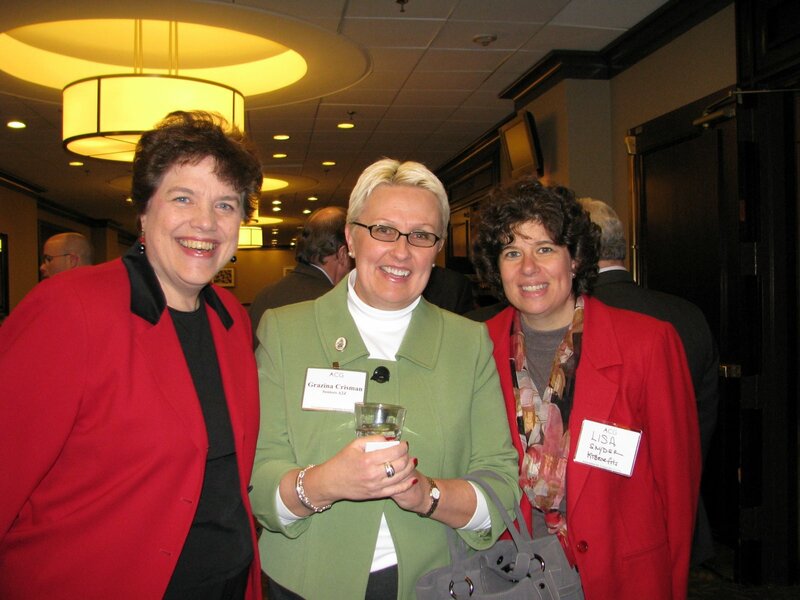 (Pictured at right, attendees Katherine Kish of Einstein’s Alley and Market Entry, Grazina Crisman of Seniors A2Z and a sponsor of the evening, and Lisa Snyder of KT Benefits and NJAWBO). Of all his good tips, what stuck with me were his percentages. He and his VCs spend 80 percent of their time on the top companies in their portfolio, just 5 percent of their time on the worst performers. Here’s the bitter lemon part: Each of their portfolio companies is required to prune the workforce by 10 or 20 percent every year. Decisions about who ranks at the bottom are made in October and November, and they are announced “at the worst time of the year,” Martinson admits, at Christmas. These cuts are spread out on all levels, not just junior staff. Well no wonder Edison companies typically grow over 40 percent a year. If you knew that you might lose your job at the end of the year, you’d work really hard even in the dog days of August. On the upside, when you cut your workforce you can upgrade your team at all job levels, and in 2009 you will have great opportunities to hire “stars” at bargain prices. Another tip: “Sell what’s ‘on the truck,’ which may not be what the customer is asking for. Those are a half dozen of the three-dozen excellent tips Martinson gave, but his main message is that savvy leaders take advantage of the down economy. Competitors are weaker, top sales talent is available, and success is sweeter. It’s a good thing I don’t run a company. Success may be sweet, but that recipe for lemonade might upset my digestion. Excellent presentation by John with advice you can actually use in your business. In a gloomy time his insight is a ray of valuable sunshine.